This Thursday May 10th two amazing bands, the Brat Attack and Expressive Humans, all about social justice will be playing a free Occupy NL concert at Harbourside Park from 4-10 PM. Read more about the Occupy NL eviction here. We encourage people to bring food for a potluck, starting at 4 PM! Harbourside Kitchen will also be cooking for the event (a vegan curried lentil dish). 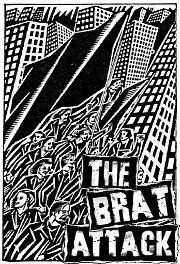 The BRATS are here until next Friday May 11th, and we want to ensure we have a wicked turnout. There are also some things we need help with: promotion (texting your friends, Facebook invites, emailing, radio shout outs, and word of mouth). Since we are volunteering to hold down this show, we need other volunteers and fans of expressing yourself, to get behind this amazing band that has been around since 2001. The Brat Attack are willing to play for free, so let's all show them mad respect and blow their mind with the best show Harbourside Park has ever seen. Comment below if you're joining us in this epic adventure of music, freedom and justice, just before Occupy Newfoundland finds a new home due to an eviction notice. "Strong people need no leader." So the final decision has been to leave the park as requested? Doesn't that confirm to the people with power that they still hold all the cards? We're not leaving early. No final decisions have been made.